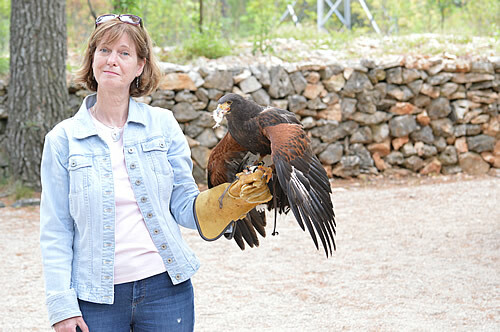 Just inland from Šibenik is the Sokolarski Centar for Falconry & Raptor Rescue. It’s in a small place called Dubrava, set in a woodland area with paths and buildings. 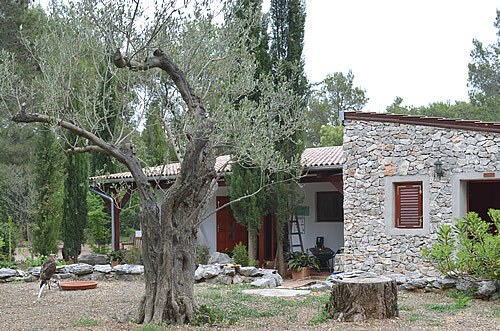 This is a veterinary centre that rescues and rehabilitates wildlife, at the same time educating the public about birds of prey, and promoting the ancient art of falconry, part of Croatia’s heritage. A few of the residents are sitting on posts or bars,with a dish of water within reach. 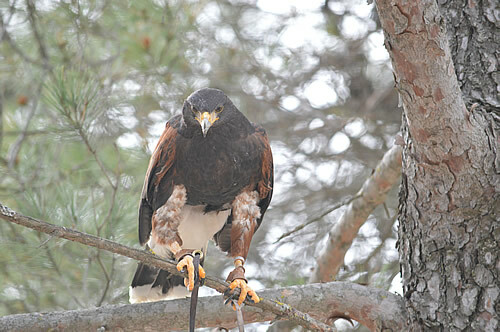 These are mostly Harris hawks and red-tailed hawks, specially bred for use in falconry. The choice of non-native hawks is quite deliberate, to keep the tame birds separate in people’s minds from the local wild bird population. The hawks are tethered, not so much to prevent them flying away, but rather to avoid any injuries if the birds take exception to having other rivals too close. The injured wild birds are kept separate, away from the general public, so as not to (a) stress them, and (b) let them get too used to humans. They will be returned to the wild when able, and it’s not good for them to learn dependency on people. 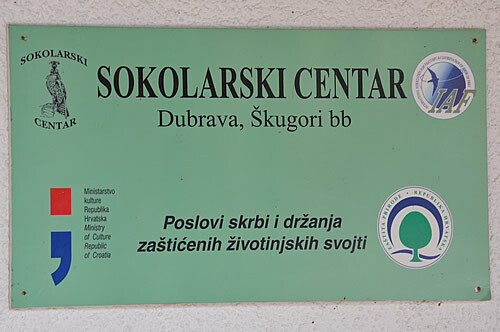 The centre manages to rehabilitate over 70% of its patients, and works with vets all over Croatia to train them in how to rescue and treat these birds. 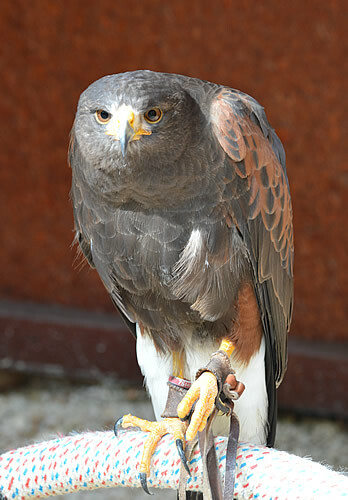 The centre also works with National Park staff, and offers seminars and workshops on all aspects of dealing with birds of prey, and even offers training if you want to take up falconry for yourself! Most importantly, they educate children to respect and appreciate these wonderful birds. Start them early and they’ll understand these birds are not threatening but part of a healthy natural environment. 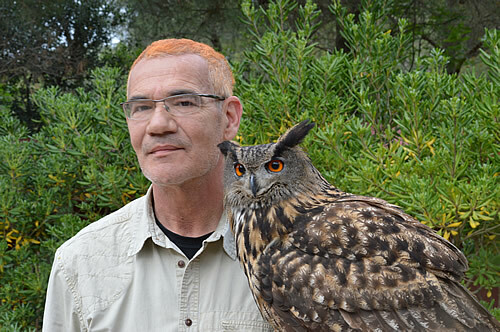 Besides the hawks, the centre also has a resident Eagle owl. Although tethered during the day, she flies free at night, but won’t return to the wild, as she’s psychologically damaged – she thinks she’s human. She was rescued as a youngster, and imprinted with the man who fed her – that must be her parent, right? So now she can’t be a wild owl, as she’ll simply attack any male Eagle owl that comes near and will look for a mate amongst the nearby humans. And that’s probably going to get her shot, and give other owls a bad name. 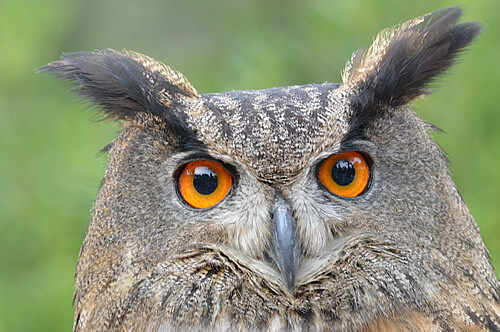 Eagle owl – no, those are not ears! Those feathery tufts on top of her head are not ears, they’re just for decoration, to look big and impressive. She has ears, but hidden amongst the feathers (he demonstrates with one of the French girls, who has long hair covering her ears!). In the case of the bird, the ears are asymmetric – the right one bigger and higher up on the head, the left one lower down and small. That helps her to pinpoint the source of small noises, then she can focus in with those extrordinary big, orange eyes. Emilio highlights the relative size of those eyes on the owl by holding up an orange to his own face – what would we look like? Interesting thought! And the owl’s eyes don’t move, her head does, swivelling almost all the way round to look behind – again, beautifully demonstrated. You could also see when something in the distance caught her interest, a sudden narrowing down of the eye, quite literally, as the eyeballs are elongated to focus further away. She can see a mouse at 6 km where I’d have difficulty seeing the side of a bus at that distance! There was much more about the abilities of owls and their eating habits, and then we moved on to the falconry display. 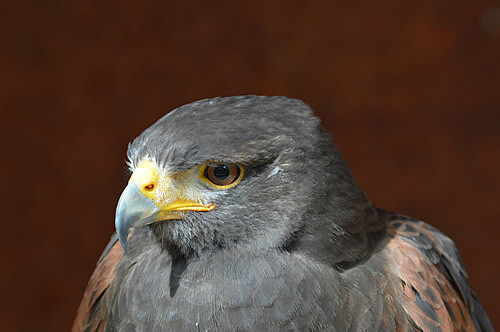 This afternoon’s falconry display is given by a Harris hawk, whose turn it is to fly. These are are specially bred and trained birds, who understand about people, and each one gets to fly for at least half an hour a day. The flight display by the hawk is impressive, especially as I get to take part, and see this large raptor up close and personal. She really is a beautiful bird, with her russet and black plumage and those fluffy pantaloons. As a vegetarian myself, I wasn’t entirely comfortable about watching her tear into her little chickie dinner at close quarters, but I did feel extraordinarily privileged to have her perched on my hand while she did it! 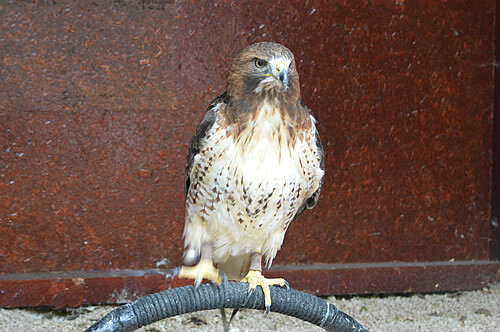 We’ve had quite the medieval theme going on today, as falconry was very popular at that time. Apparently it was quite common for women to keep hawks for hunting, supplementing the family dinner. No vegetarians back then! 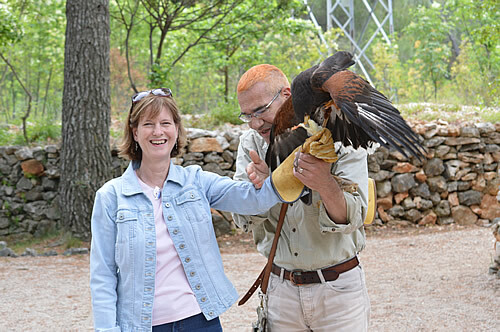 This particular hawk is around 20 years old, and has been demonstrating the finer points of falconry with Emilio for years – very relaxed as he explains what she will and won’t tolerate. For example – stroking with a hand can be seen as threatening, while rubbing his face against her feathers is quite acceptable! Another fascinating presentation, and we follow it up with a general chat about birds of prey in Croatia, and Hvar in particular. Hopefully, with a centre like this educating people, the future will be brighter for these wonderful birds. If you’re in the Šibenik area, do visit for a fantastic time and support their efforts. Great outing for adults and kids alike! If you do plan to visit, call ahead so they can coordinate the displays. This has been one of the highlights of our trip, a really special experience! Many thanks to Emilio and his team for all the good work you do! Meanwhile, in a different country on a related topic: The Dyfi Osprey Project facebook page. Watch a family of ospreys raise their chicks – first egg hatched for 2015 as I write this article!